I'm looking forward to Nuzzel notifications here. You’ll soon find a button on many of your favorite apps and sites that says “Add to Slack”. Clicking the button will take you to an authentication page where you’ll pick which Slack team you’d like to integrate with the service, and which channel (or your own @slackbot) the service will report to (provided your Team admin/owners allow team members to add integrations). Once configured, any web apps or services that send you notifications or emails can start automatically reporting those to Slack. Many apps and services will also give you the ability to share things into Slack without leaving their app; handy! We use Slack at MacStories, and we pay for the fantastic service it offers. Something I've recently started testing is using Slack as a shared notification layer for multiple users: rather than being alerted of important news or updates myself and then having to communicate them manually to others, I can let the notification go to Slack directly so everyone can know instantly and take action more quickly. I've been doing this with integrations such as RSS, Zapier, IFTTT, and the recently launched email in both regular Slack channels as well as a dedicated #aggregator channel where bots only report notifications and links. 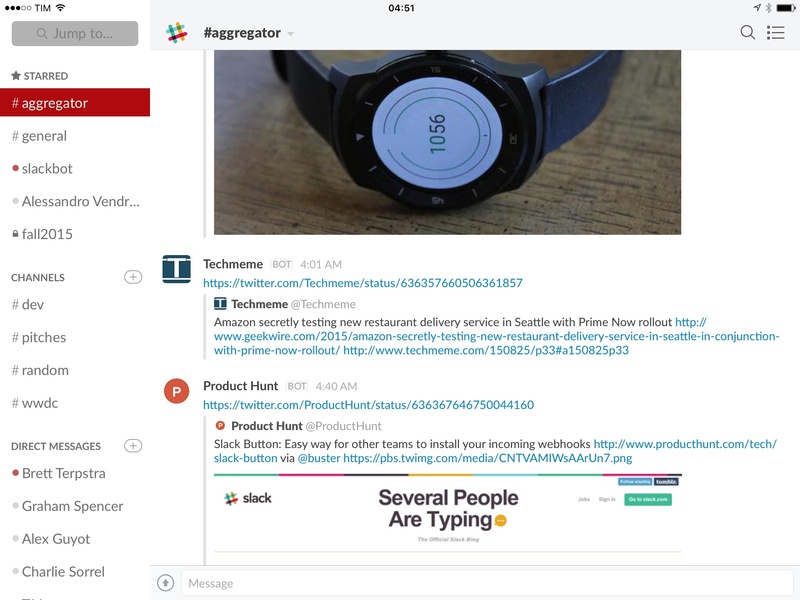 With today's announcement, Slack is making it easier for developers to build support for Slack notifications even if their apps have nothing to do with Slack as a chat service. This is where Slack radically differs from everything I've tried before: it's not just a chat room with a bunch of integrations – it's a whole layer of services, commands, file management, search, and collaboration that is primarily advertised as a communication tool. It makes sense, then, to properly support rich notifications as extensions for Slack: because users are spending hours in Slack anyway, services like Nuzzel can support native device push notifications (individual) and Slack notifications (shared), allowing multiple people to receive the same notification and coordinate accordingly (inside Slack, of course). I've set up Nuzzel integration today (on the website), and, if my understanding is correct, I can expect my Twitter alerts powered by Nuzzel (and years of carefully curating my following list) to be available to other team members through Slack notifications. I have a feeling this is going to be a pretty great addition to our Slack setup, and I fully expect more web services to start supporting Slack notifications as a feature soon.